Everyone wants loyal customers. That is what database marketing is all about. But how do you go about building and maintaining that loyalty in a business to business situation? That is the question one company, Panduit Company, of Tinley Park, Illinois, has answered with a highly innovative method using Electronic Data Interchange which can be used in a wide variety of business situations. Panduit is one of the largest manufacturers of components for the electrical industry, with more than 60,000 SKUs in stock. They market exclusively through 1,800 distributors in the USA. These distributors, in turn, sell to maintenance & repair shops, industrial construction firms, original equipment manufacturers and communications firms. There is a lot of competition in the industry. Profits are down. The average distributor who was making 2.13% on his sales revenue in 1989 dropped to 1.50% in 1993. The picture since then is no better. The distributors are plagued with low market growth rate, rising operating costs, and low profitability. The return on total assets dropped from 7% in 1989 to 4% by 1993. When their customers hurt, Panduit hurts. Something had to be done. Panduit Corp. worked directly with several of their largest distributors to analyze their problems. They knew profits were low as industry data showed that distributor’s average gross margin was 20.7% and operating costs as high as 19.2%. Some of the largest problems were due to purchasing, accounts payable, receiving and put away, inventory carrying costs, incoming freight and returns. The urgent need for these distributors was to reduce their replenishment costs, increase their inventory turns, improve their service level, and eliminate the many errors that were common in the industry. The solution which Panduit Corp. presented to them was adoption of Electronic Data Interchange involving automated communications between Panduit and their customers, and Vendor Managed Inventory. The system was explained by Bernard Westapher, Vice President, Marketing and Sales, in a talk to the Second Annual Executive Networking Conference in Chicago. CEO’s of sixty major distribution companies enthusiastically received Bernie’s talk. The EDI system has been around for some time, but had not been used to link distributors and suppliers in the way that enabled many suppliers and distributors to do it quickly and inexpensively. Each distributor and manufacturer used unique mappings which required interpretations. The results were slow and expensive. Furthermore, although Panduit liked it, their distributors could see no cost reductions for themselves in adopting it. They preferred to use the fax. It was easier and cheaper for them. Most suppliers were promoting the EDI system strictly to enter orders. If Panduit and other suppliers were to cut costs for their distributors, they had to provide order entry, order acknowledgment, advance shipping notice and invoicing all through the same paperless system. To get the real payoff, the distributors had to integrate their systems with EDI. But each distributor already had a system which they had purchased from various business system providers which could not be easily integrated with EDI. The industry standards required interpretation so each supplier and distributor had to negotiate custom arrangements to utilize EDI. In short, the EDI system was nothing short of chaos: poor understanding, very slow implementation, and quite a bit of resistance. To solve the problems, Panduit invested a great deal of time and money. They secured the agreement of four other key suppliers to their industry. Then, Panduit modified their own system to accommodate the requirements of these four suppliers and, hopefully, most other suppliers. They called their new system the Qualified Supplier Program (QSP). Using these suppliers as a template, they developed a turnkey package. They found an external vendor, Advantis which could supply the translators mapped to QSP standards to all parties concerned. Panduit took out advertisements, published the standard mapping specifications, and invited other suppliers — including their competitors — to adopt the new system. After two years of work, Panduit had persuaded 34 major electrical suppliers to adopt the new QSP system, and were testing with many more. Some of the suppliers using the new system include Allied Tube and Conduit, Leviton Manufacturing, American Insulated Wire, Allen-Bradley, Appleton, Philips Lighting, and Hubbell. As a result of their success, the National Association of Electrical Distributors took over responsibility for promoting and administering the program throughout the entire industry. Within 1.5 minutes after a distributor places an order with Panduit through the EDI system, Panduit has received the order, processed it, acknowledged it, prepared a shipping manifest for printing in their warehouse. Most products are on their way to the distributor the same day as the order. Human errors, which plagued the industry before (with 60,000 parts, many with similar part numbers), were minimized. Distributors received advance shipment notices, via EDI, telling them how many boxes were being shipped, the contents of each box, and identification of the bar coded license plate on each — all electronically, without any paper required. This is the foundation for a computer-controlled receiving system called Pan-Receive. The ultimate cost saving device, however, has been the extension of the EDI system into VMI – vendor managed inventory. In this system, Panduit knows exactly what every one of their distributors has in their warehouses at all times. Panduit’s VMI engine (the replenishment system) takes into consideration distributor’s booking trends through a powerful forecasting program, receiving costs, inventory carrying costs, and many other factors to determine the replenishment quantity and shipping frequency to provide the distributors with the lowest total operating costs at the service level specified by the distributor. Panduit automatically ships the needed items and generates an electronic invoice and advance shipping notice. If experience shows that some items are being used up at a faster rate than anticipated, Panduit VMI replenishment system automatically responds to ensure the specified service level is met at lowest total operating costs for the distributor. Whenever the computer shows that customers are maintaining too much stock of slow moving items, Panduit generates a return order with no restocking charge. In other words, the customers have really let their vendor, Panduit, take charge of their inventory system. This is the ultimate in cost reduction, maximum service and error elimination. Vendor managed inventory represents partnering between the supplier and the customer. It lowers mutual operating costs, optimizes shipment quantities, and achieves excellent service levels for the distributor’s customers. . It does this by using advanced forecasting techniques. The usage for each of the 60,000 SKUs is forecasted based on prior 24-month usage by each distributor branch — on a running basis which is recomputed every month for every part number for every distributor location on VMI. Why do Panduit distributors like it? Costs are down, and profits are way up. They are providing far better service to their customers. Out of stock conditions have been reduced to an absolute minimum, which, in turn, helps the distributors keep their customers. What Panduit has done is to find a really creative way to build customer loyalty by solving their customer’s — the distributors — problems. It’s very nice to send birthday cards, newsletters, provide gold cards, or have customers accumulate points or air miles, but the EDI-VMI system goes way beyond that. Panduit made a real study of their customer’s problems. They realized that their success was based on their customer’s success. Low profits were killing the industry. They spent many hundreds of thousands of dollars in finding out why profits were down, and what they could do about it. Once they developed a solution, they put their whole weight in the industry towards solving it — enlisting and encouraging their customers and other suppliers — including their competitors — to adopt the same system. In a sense, Panduit was doing what the airlines did. By adopting universal standards for reservations and flight bookings open to all in the industry, they helped the entire industry to survive and prosper. The EDI-VMI solution does not have to be confined to the electrical industry (although that is where it is right now). It can be adapted to a wide variety of industrial situations. 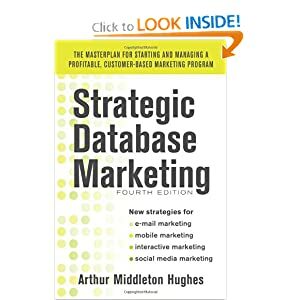 Database marketing will be successful, only if the customer benefits from it. How can you help to solve your customer’s problems? EDI offers a solution. The Internet is another. If you are a manufacturer of business products and haven’t considered such a system, start thinking now. What do you think the electronic linkage between Panduit and their customers will do to their customer retention rate? To customer loyalty? To sales? What is it worth to Panduit’s bottom line? Think about it. This is where database marketing is headed in the business to business field. Get aboard before it is too late!